Tennessee Valley Federal Credit Union president Blake Strickland sits in the lobby of the facility. The number of credit unions in the United States has fallen by nearly 40 percent over the past decade, including a drop of 546 institutions last year alone. But don't take that decline as any sign of trouble. Most of the credit unions that began decades ago with a small office, or a desk at a company work site for employees to pool their savings and get small loans, are much different today. Credit unions have combined and expanded their membership bonds and services and, in the process, have grown their membership, asset size and profits. Most now have multiple branches and online services and many are now making small business loans. As a result, credit union consultants at Callahan & Associates expects America's credit unions could have a record year for loans and income this year. In the first three months of 2015, loan volume among all credit unions was up 10.6 percent from a year ago and capital grew by 8 percent above the same time in 2014. "By all measures this has been a tremendous start for 2015," says Jay Johnson, the executive vice president for Callahan. "I think we are looking at a record year for the industry." Prior to the Great Recession at the end of 2006, there were 8,695 credit unions in the United States —1,422 more than there are now nationwide. But even with fewer credit unions, the total amount of money held in credit unions jumped by 49 percent over the past eight years. Last year, the National Credit Union Administration (NCUA), the federal agency that regulates credit unions and insures credit union deposits up to $250,000, reported that only 21 credit unions shut down, and only 10 of those were ordered closed. "Most of the reduction in the number of credit unions involves the merger of healthy institutions," NCUA's John Fairbanks says. "There are tiny credit unions with only $50,000 in assets run out of kitchens or small offices. But those often opt to merge with another credit union and we've been seeing that trend for some time." In Tennessee, credit unions have been bolstered by major federal facilities in the state. Among the six biggest credit unions in Tennessee, five were created from employees at major government-owned energy, military or research facilities. The relatively strong credit union presence in Chattanooga helped create the Tennessee Credit Union League in Chattanooga in 1934, the same year that President Roosevelt signed the Federal Credit Union Act to allow credit unions to be chartered either under federal or state law to help encourage both thrift and borrowing for workers at their job sites. The Tennessee League, the primary trade group representing more than 150 credit unions in Tennessee, has remained in Chattanooga ever since. Other than the state's biggest credit union — the $3.1 billion-asset Eastman Credit Union in Kingsport — the next biggest credit unions in Tennessee are the $1.7 billion Ascend Federal Credit Union in Tullahoma which began by serving employees of the Arnold Engineering Development Center (AEDC) at the Arnold Air Force Base in Tullahoma., the $1.6 billion-asset ORNL Federal Credit Union created for employees at the Oak Ridge National Laboratory, the $1.4 billion-asset Knoxville TVA Employees Credit Union started to serve TVA employees at the utility's headquarters in Knoxville, the $1.1 billion-asset Tennessee Valley Federal Credit Union initially created for TVA employees in Chattanooga and the $749.7 million-asset Y-12 Federal Credit Union which started to serve employees at the Y-12 weapons plant in Oak Ridge. All of those federal and major employer-aligned credit unions have since expanded their fields of membership to allow anyone who works and lives around their offices to join. The expanded eligibility for membership along with mergers with other credit unions and additional branch locations have combined to make the state's biggest credit unions into rivals with many banks in their respective service territories. In Chattanooga, for instance, the Tennessee Valley Federal Credit Union is bigger than all but three banks operating in the market and is now the biggest locally based lending and depository institution in town. The Tennessee Valley credit union is also the biggest automobile lender in the region. The credit union operates 14 offices in 13 counties and has more than 114,000 members. Last year, two more credit unions — Chattanooga Coca-Cola Employees credit union and City Employees credit union — merged with Tennessee Valley credit union, adding to more than a dozen earlier credit union mergers into Tennessee Valley. 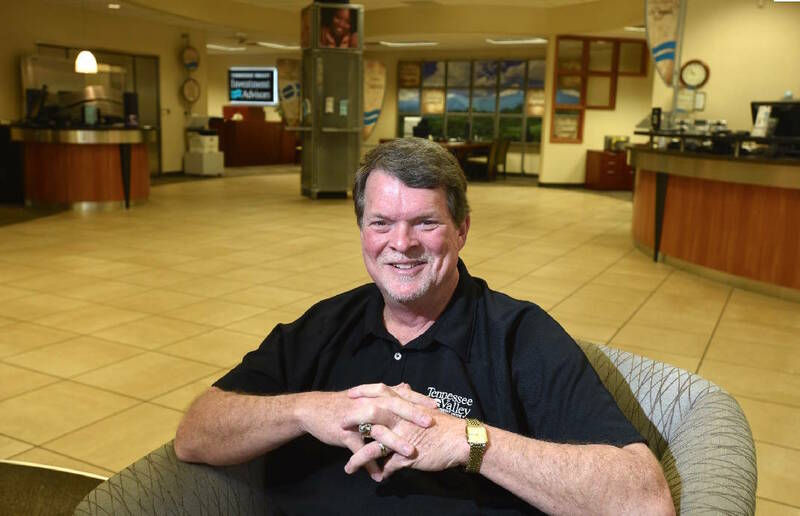 "These were well run credit unions, but they have to comply with all of the regulations and fill out all of the forms that we do but those costs are spread over far fewer members," says Blake Strickland, the CEO of Tennessee Valley Federal Credit Union since 1999. Unlike mergers or acquisitions of banks where shareholders usually get paid a premium, all of the gains from any credit union merger go back to the members who own the credit union. But as the size and services offered by credit unions has expanded, banks claim that the non-profit, tax-exempt credit unions have an unfair advantage. The U.S. Office of Management and Budget has estimated the federal treasury may be losing nearly $2 billion a year from untaxed income from credit unions. The American Bankers Association, the principal trade group for the banking industry, argues that many larger credit unions have outgrown their mission and their tax exemption. Among more than two dozen credit unions across the country with more than $1 billion in assets, four are in Tennessee. "Many of today's credit unions bear little resemblance to the industry that received this special tax exemption and today have become indistinguishable from the banking industry," the ABA argues. "Credit unions have leveraged their taxpayer subsidy to aggressively grow, becoming a $1 trillion industry. And as the credit union industry expands, it does so at the expense of all taxpayers." But credit unions insist they operate differently from banks and don't make major commercial or industrial loans. Directors on credit union boards are not paid and Strickland said most credit union managers and executives are paid less than their counterparts at commercial banks. Credit unions also provide competition for banks and, if they were taxed, many would have to either raise fees, lower returns on deposits or go out of business, according to credit union advocates. "We operate for the benefit of our members and try to help people with their personal needs, whereas a lot of banks are more geared toward businesses," says Terri Stansell, president of Chattanooga First Federal Credit Union, which began as U.S. Pipe & Foundry Employees credit union and has since merged with other credit unions and expanded to a community charter in 2009. "We make personal loans for $1,000, where the minimum for such loans at most banks is $5,000." While most of Chattanooga's biggest credit unions have grown by opening up their fields of membership to community workers and residents, one of fastest rates of loan growth in the past five years has come at Trust Federal Credit Union, which was recently recognized by the Credit Union Journal for having the country's second fastest rate of growth on loans over the past five years of any credit union its size. David Smart, president of Trust Federal Credit Union in Chattanooga, said since he became CEO in January 2008 the credit union has worked to make more loans, even during the Great Recession. "In 2008 and 2009 when all of the banks were tightening up, we remained active with our loans and tried to do what we could to help people out," he says, noting that loan charge-offs have remained below industry norms. In 2009, only one in four members of the Trust Federal Credit Union knew that the credit union made real estate loans. But Smart, who has helped to more than double the size of Trust Federal Credit Union over the past five years, said he has worked to let members know about borrowing opportunities for consumer and mortgage loans. Smart said by consolidating higher-interest loans and credit card bills into lower-rate credit union loans, Trust Federal saved one couple borrower $630 a month. "Those kind of stories have helped us to reach more people and we've tried to get the word out that we have money to lend," Smart says. This story originally appeared in the June edition of Edge magazine.